With the President's Day holiday yesterday along with some commits having games yesterday the Quinnipiac recruiting notes were pushed back a day. The men's ice hockey team concluded its regular season road schedule with a split in the New York capital district. After a 4-1 loss on Friday to Union College the Bobcats cruised past the RPI Engineers on Saturday 7-3. They now head home to conclude the regular season against Yale and Brown with an outside shot at first round bye if things break the Bobcats way. With that said let's look back and see how some of the future Bobcats did this past week. Springfield Jr. Blues forward Matt Cassidy was named the NAHL Midwest Division Star of the Week. 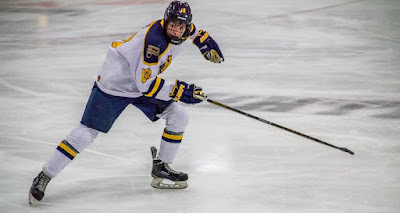 The 1999 forward out of Medford, New Jersey had six points in three games this past week (3 goals and 3 assists) and he had a career-best NAHL game on Saturday when he had two goals and three assists in the Blues 10-2 win over the Kenai River Brown Bears. In 41 games played for Springfield, Cassidy has 27 points (11 goals and 16 assists). He is projected to arrive in Hamden for the 2018-2019 season. Matt Forchuk continues to remain hot for the Canmore Eagles. The leading scorer in the AJHL is riding a nine game point streak (6 goals and 12 assists). Over the past week he has nine points (1 goal and 8 assists) in 4 games played. In 52 games played this season, Forchuk has 87 points (27 goals and 60 assists). He has 39 of those points via the power play (8 goals and 31 assists). The 1996 forward is expected to be an important player for the Bobcats next fall as they look to generate more offense than they have so far this season. Hamden native Joe O'Connor had a six assist week for the Brooks Bandits (AJHL). The 1996 defenseman has returned from an upper body injury to become close to a point per game player from the blue line in only 13 games. He exploded for four assists in a win for Brooks on President's Day. On the season he has 11 points (1 goal and 10 assists). The 6'2 defenseman has shown the ability in two years from the blue line a knack for racking up points along with bringing some toughness to his game. He is part of the 2017 incoming recruiting class. 1999 goaltender Keith Petruzzelli made 57 saves on 59 shots in two wins for the Muskegon Lumberjacks (USHL) this past weekend over Youngstown and Chicago. Petruzzelli has shined in his rookie season with the Lumberjacks becoming the top North American goaltender in the Central Scouting Midterm Rankings. In 25 games played for the Lumberjacks, Petruzzelli is 15-8 with 2.53 goals against average and a .911 save percentage with two shutouts this season. The Wilbraham, Massachusetts native is expected to come in and compete immediately for playing time. He is expected to be likely the highest Quinnipiac player selected in the NHL draft this June. 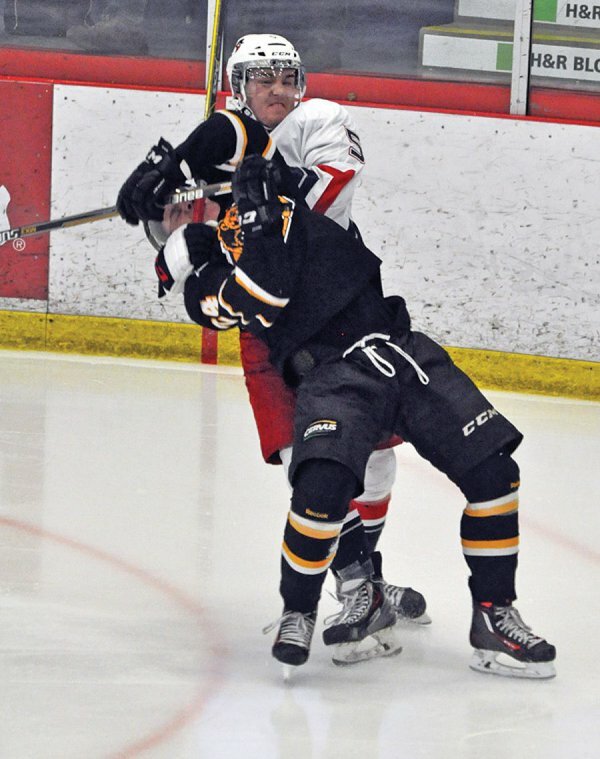 1997 forward Devin Moore had a six point week for the Brockville Braves (CCHL). In three games, Moore had four goals and two assists with three of his goals coming on the power play. This season in 55 games played, Moore has 50 points (23 goals and 27 assists). He is also a threat on the power play with 22 of his 50 points coming on the man advantage (9 goals and 13 assists). Moore is heading to Quinnipiac this fall and should be able to help boost the Bobcats offense. A couple of future Bobcats had their season end on a sour note. North Jersey Avalanche 1999 forward Corey Clifton and 1999 goaltender Justin Robbins lost in the championship game of the Tier I Elite Hockey League U18 Championship to Victory Honda 2-1. Robbins played in three of the four playoff games going 2-1 with a .99 goals against average and a .943 save percentage with one shutout. He finished the regular season going 19-1 in 21 games played with a 1.79 goals against average and a .935 save percentage with five shutouts. His USHL rights are held by the Chicago Steel and he has a good chance of playing with them next season. Clifton, the younger brother of current Bobcats Connor and Tim Clifton had a goal and an assist in five playoff games. He finished the Tier I regular season with 21 points (5 goals and 16 assists) in 31 games played. Clifton also plays high school hockey for Christian Brothers Academy in New Jersey.